SINGAPORE - What began as a Christmas celebration in Sembawang Park ended in chaos for Ms Carine Yeo, 44, and her friends. Ms Yeo, a supervisor with transport operator SMRT, and her colleagues were enjoying food and drinks when it started raining heavily on Thursday (Dec 20). The group of 17 friends sought refuge under a pavilion. "We were all eating under the hut when it happened," she said. "The tree fell on the roof and the roof collapsed." 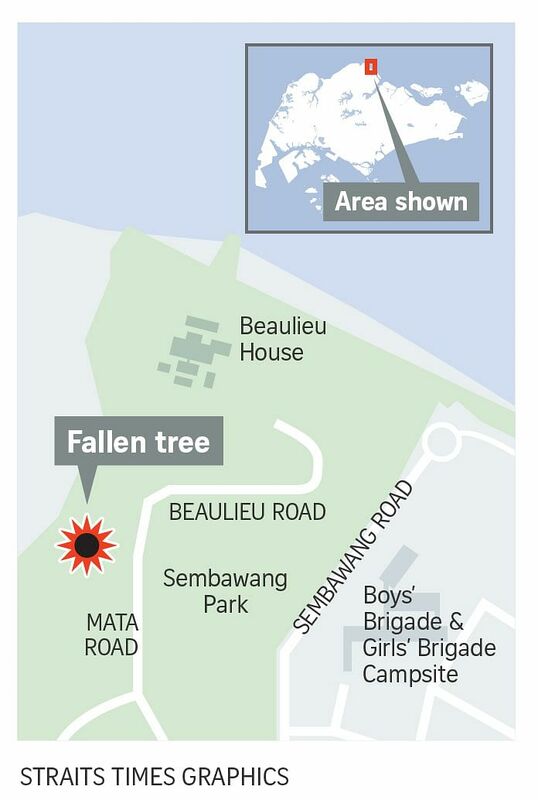 In a statement on Thursday, NParks said a Erythrophleum suaveolens tree, also known as ordeal tree, fell on the pavilion. The tree is around 21m tall and 3.1m in girth. Another tree in the park - a Tabebuia rosea or rosy trumpet tree measuring about 18m in height and 3.6m in girth - was also uprooted. "My friends were trapped under the log and roof," Ms Yeo told The Straits Times. "We tried to lift the planks and pull out those trapped under." By the time the ambulance arrived, she and her friends had pulled the rest of the group to safety. "One of them had to be piggybacked," she said. "I am still in shock from what happened." When ST spoke to Ms Yeo, she was seated at a shelter looking shaken. There were wet clothes on the seat, along with a box of water and chips. On the seat were also unwrapped presents, a smudged cake and some ham. Her colleague, Mr Loganathan Raju, 38, arrived at the park just after the tree fell. "I was late for the meet up. When I arrived, my friends called and told me the shelter had collapsed. I thought it was a prank," he said. "It was raining heavily but we could not find an umbrella. I just ran over and saw the ambulance," he added. "This was the first time we planned an outing... I don't understand how this happened." SMRT route controller Chandra Das, 28, was one of those at the gathering. "We ran into the pavilion to hide from the rain, when suddenly the tree fell down. Everything happened in a second," she said from Khoo Teck Puat Hospital. She added that her husband, Mr Navin Sangar, 25, also an SMRT route controller, required stitches on his forehead. When the tree fell, there were sharp edges poking into the pavilion. None of them tried to push the tree up, and those who could move slowly crawled out from underneath, said Ms Chandra.